Flexible working. Over the last 15 years in my HR career, these words are becoming more and more important. As lots of people experience parenthood, different lifestyles or life changes, more flexible working conversations are taking place in the workplace. So what’s the #flexappeal campaign all about? Created and led by Anna Whitehouse of motherpukka.co.uk, it’s about raising awareness of the benefits flexible working brings to a business and its teams. A few years ago, Anna starting chatting (and vlogging) about her career change and childcare challenges. Many other women and men immediately recognised her story. They also had to make big career decisions to be around their children, navigate childcare arrangements or juggle the huge cost. It sounds so simple just wanting to be around or wanting to eat dinner with your children doesn’t it? This isn’t just about mums who are sometimes assumed to be the primary carers for children. It’s about dads and other carers too. She kicked off the #flexappeal campaign a while ago to raise flexible working awareness in different organisations, companies and employers. It’s about reminding them how flexible working can help their business and it’s not just about the employee. The #flexappeal campaign has also been a supportive hub for those who share career and work-family struggles. One thing I love about #flexappeal is that it isn’t just about parents. It’s bigger than that. People spend a huge amount of time commuting. Don’t forget the extra hours worked at the start and the end of the day. There are many reasons why people need to work flexibly. They may need to work flexibly for health reasons (temporary or lifelong), studies, volunteer work or maybe because they just want to. Anna’s #flexappeal has brought together lots of people who share the same problem: how to work without family-friendly or lifestyle-friendly hours. Last Friday, Anna brought together an amazing group of 336 people at Trafalgar Square. 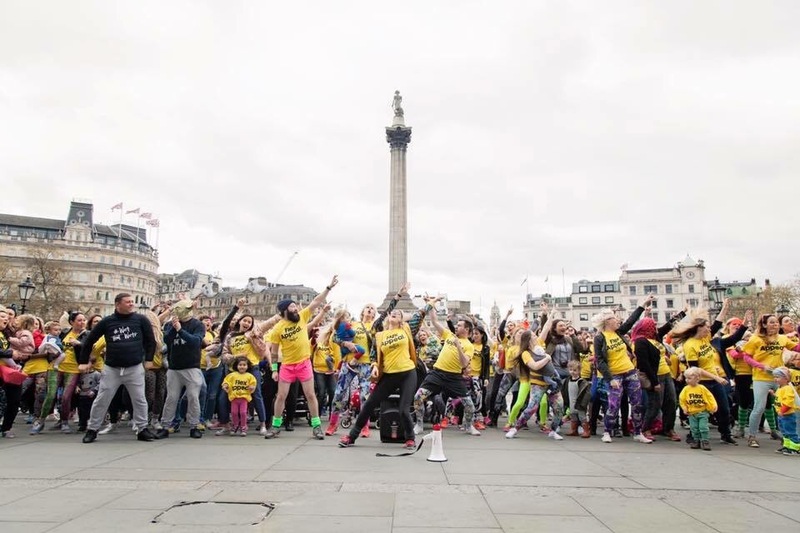 Mums, dads, grandparents, carers, friends, toddlers and babies all congregated at the top of Trafalgar Square ready for the midday flashmob. Trafalgar Square’s street artists also did their bit. It will be featuring on BBC’s The One Show this week. It was great being part of the crowd last Friday, seeing lots of familiar faces and meeting new ones. As a HR bod, having helped so many people and managers to discuss and agree flexible working requests over the years, it’s something close to my personal and professional heart. 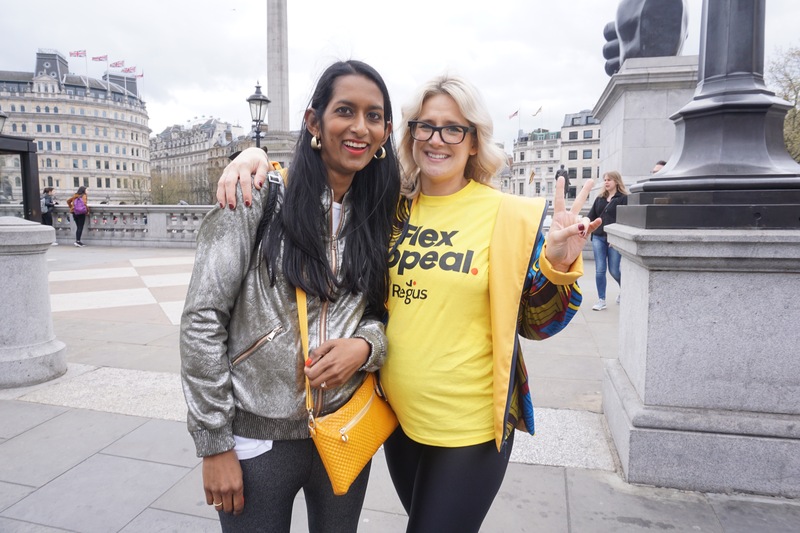 Everyone was there for the same reason; to do their bit for the #flexappeal and to bust a few moves in their #flexappeal t-shirts (sponsored by Regus). Many popped down in their lunch break or stocked up on snacks so the toddlers keep entertained. Lots of people couldn’t be there at the #flexappeal event last Friday but supported from afar. Anna’s sense of humour is amazing and so is her drive when it comes to spreading the word about #flexappeal. Here’s a few things you can do to support the #flexappeal campaign. On 9 May 2017, share your flexible working story or experience on Instagram (and tag @mother_pukka and #flexappeal). Follow the #flexappeal progress via motherpukka.co.uk or Facebook.com/motherpukka. Anna also announced that she has partnered with the Equality and Human Rights Commission as #flexappeal will be using their research to further the project. If you know Anna, she loves her facts and statistics. Speak about the companies who are really making flexible working work for their business and their employees. The more positive stories we hear, the more organisations can inspire each other to try out different things. Speak to your manager or HR team about whether your company or organisation is happy to support flexible working. Don’t ignore your ideas for your own flexible working. Test them out with a trusted pal or seek some practical career or HR advice. I’ll be sharing more tips on asking for flexible working in the Career section on Lucky Things soon. What do you think about flexible working? Do you need or want to work flexibly? It would be great to hear what you think too. Let’s keep talking about flex.